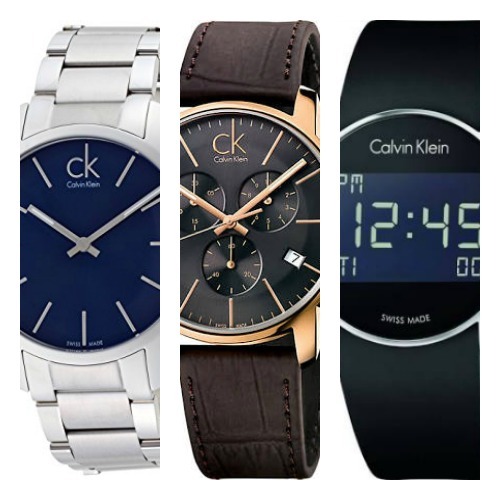 Hello everyone, today we’re doing a Calvin Klein watch review and also featuring 5 of their most popular watches that are currently available. The Calvin Klein brand were launched in 1968 and were an instant hit among fashion fans. 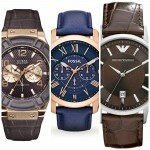 They have a wide variety of stylish watches available for both men and women. If you like fashion designer watches you should also check out our best Hugo Boss watches and popular Emporio Armani watches. 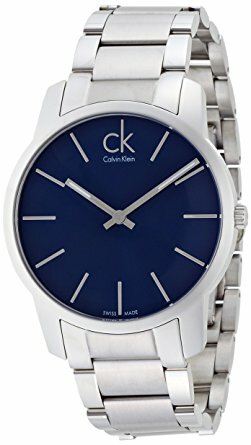 Are Calvin Klein Watches Good? But are Calvin Klein watches any good? That’s what you really want to know, isn’t it? 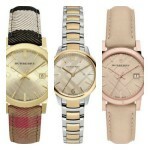 In my personal opinion, I think they’re rather nice and decent value for money for a designer watch brand. No, watch snobs aren’t going to like them, but that shouldn’t really matter to you. If you like the style and design of the watch and are happy with the Calvin Klein brand then I’d definitely recommend checking them out. All the watches featured in today’s list of Calvin Klein watches are Swiss made and feature quality Swiss made movements. The watches are relatively affordable in my opinion. Of course, I’d recommend checking out more of my 100 best watches under £500 if you get a chance to. 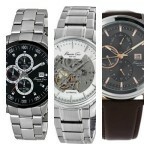 Below I’ve featured 5 popular affordable Calvin Klein watches. Obviously, this is just a small snap shot of what’s available from this designer watch brand and intended to give you an idea of what’s available. If you have any questions about any of the watches featured here just comment below and I’ll try to help you out as soon as I can. First up on our look at some of the most popular Calvin Klein watches for men is this stunning Calvin Klein City timepiece. This gents watch features a beautiful PVD rose gold plated stainless steel casing with a 43mm diameter and a thickness of 11mm. The strap is made of a brown soft genuine leather and fastens with a buckle style clasp. I’m a big fan of this large chronograph dial design. I think the black dial goes really well with the slim long rose gold tinted baton style hour markers and hands of the watch. There’s also a neat little date display tucked in at the 4 o’clock position. Powering this men’s Calvin Klein watch is a Swiss made quartz movement for reliable and accurate timekeeping. The lens is made of a specially hardened mineral glass for protection from scratches and shattering. This timepiece also has a 50m water resistance rating which is suitable for this style of watch in my opinion. Read my full K2G276G3 Calvin Klein watch review here soon. 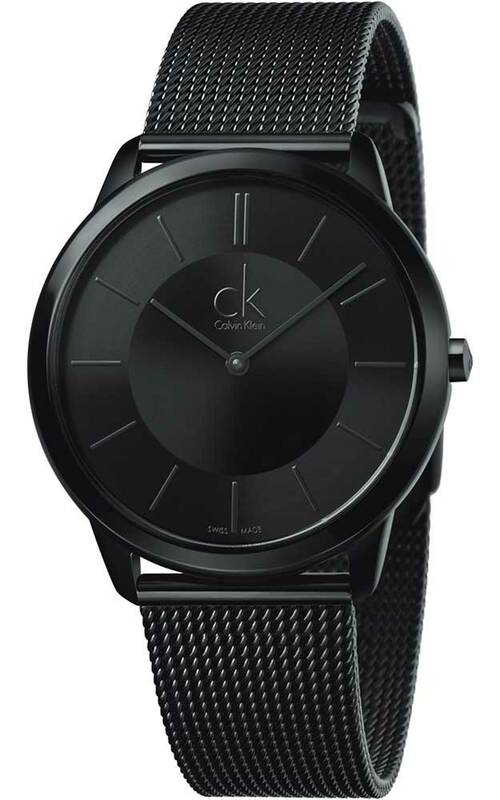 Up next on our Calvin Klein watch review top list is this beautiful minimalist watch. This timepiece features a black ion plated 40mm stainless steel casing that has a slim depth of just 7mm. The strap is also made of steel with a black ion plating and comes in this mesh style. It fastens with a jewellery type clasp. The dial of this watch comes in all black with slim hands and baton style hour markers. These could prove hard to read in dim lit conditions, this is quite common with all black watches for obvious reasons. It’s the type of watch that’s picked for style over practicality. At the heart of this minimalist Calvin Klein watch is a Swiss made quartz movement that’s both accurate and reliable. A mineral crystal glass on the front of the watch also gives you a good level of scratch resistance and shatter resistance. This timepiece has a 30m water resistance rating. You can read my full K3M214B1 Calvin Klein watch review here soon. 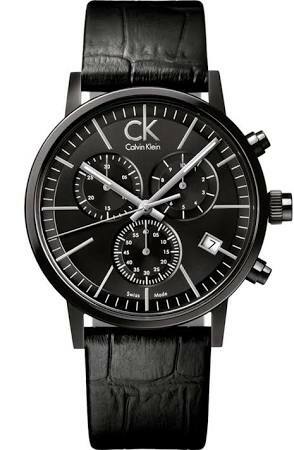 Here we have a popular black Calvin Klein chronograph watch. This timepiece has a large black ion plated stainless steel casing with a 42mm diameter and 13mm thickness. It’s been paired up nicely with a black genuine leather strap that fastens with a buckle style clasp. I like the dial design of this chronograph timepiece. The silver coloured slim baton hour markers and hands stand out nicely against the black background of the dial. There’s lume on the hour and minute hand to make them easier to read in dim lit conditions which is useful. And you’ll find a date display at the 4 o’clock position too. A Swiss quartz movement has been used to power this chronograph watch, this is an accurate and reliable movement which is great to see. Protecting the dial is a mineral crystal glass for a good level of scratch and shatter resistance. This men’s Calvin Klein watch also has a 30m water resistance rating. You can read my full K7627401 Calvin Klein watch review here soon. In at number 4 we have this popular Calvin Klein digital watch, the only digital watch that we’ll be featuring in today’s list. This men’s timepiece features a 38mm stainless steel casing with a depth of 10mm. The strap is made of rubber for a comfortable fit and fastens with a buckle style clasp. 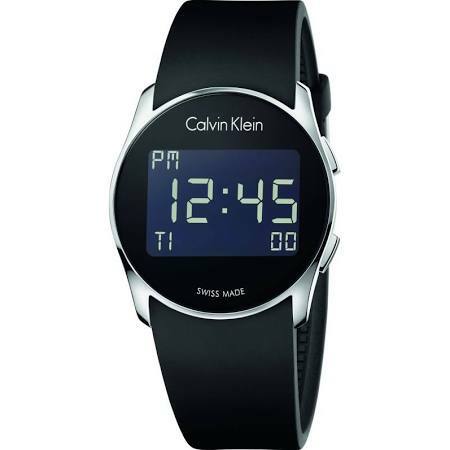 The Calvin Klein watch features a digital display with large easy to read numerals. Functions of this digital watch include a date display and alarm. A Swiss quartz movement powers this digital men’s watch, it’s reliable and accurate. Protecting the front of the watch is a specially hardened mineral crystal glass for shatter and scratch resistance. This model also has a 30m water resistance rating. You can read my full K5B23TD1 Calvin Klein watches review here soon. 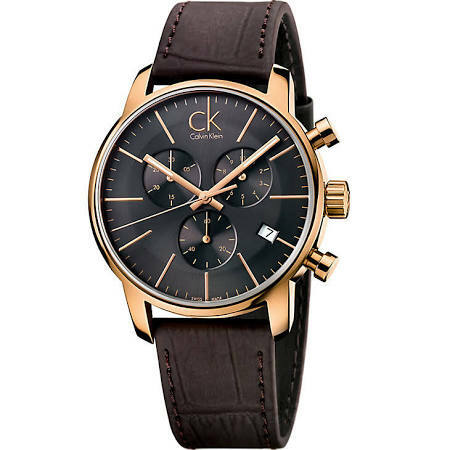 Last up on this look at the most popular Calvin Klein watches for men is this stylish looking timepiece. This Calvin Klein City watch has a large 43mm stainless steel casing with a thickness of 7mm making it quite a slim men’s watch. The strap is also made of stainless steel and fastens with a push release butterfly style clasp – one of my favourite types. The dial has a simple yet easy to read design with these slim baton style silver coloured hour markers and hands. I really like this blue coloured background as it makes the watch stand out a little on your wrist. This Calvin Klein City watch is powered by a Swiss made quartz movement for accurate and reliable timekeeping. It also has a mineral crystal glass for a good level of scratch and shatter resistance. Like many of the watches featured today it also has a 30m water resistance rating. You can read my full K2G2114N Calvin Klein watch review here soon. Thanks for taking the time to read through today’s Calvin Klein watch review. What was your favourite watch featured today? Comment below and let me know.